Create one-of-a-kind functional artwork that will be cherished for years to come with this treasury of classic gunstock carving patterns. You're sure to find the best carving pattern here for your next project. 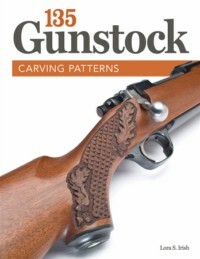 From basic checkering to dramatic relief carved scenes nationally recognized carving artist Lora S. Irish presents 135 great gunstock patterns featuring traditional sportsman and hunting-related themes. She offers an array of excellent choices for every skill level from beginner to expert so you can start with a basic pattern and tackle more intricate designs as your experience in gunstock carving grows.